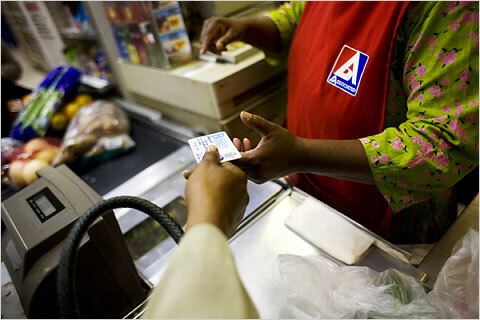 Andrew Henderson/The New York Times Using a food stamp card in Brooklyn. A recent article in The Times by Jason DeParle and Robert Gebeloff detailed the effects of the soaring dependence on government food stamps in the United States. The social stigma of using them has faded, the Times writers found, yet judgments are still made. If people buy fresh vegetables or other relatively expensive though nutritious foods, they are considered to be living high on the hog at the taxpayers’ expense. But if they buy cheap foods like hot dogs they are criticized for poor health habits. Despite these common complaints, does the system work? Are the current rules fair in regulating what people can buy and not buy? Or should the requirements be changed? Should un-nutritious products like soda be banned? Is there a better way to distribute free food and promote nutrition in this country? Click on the title to go to the original page and see what other food policy experts and Bloggers have to say. What I am really excited about is the heated comments section that follows this piece. What a great discussion it generated! Are you drinking the pounds? Just how bad is the obesity problem?